Boasting large tracts of World Heritage area, Tasmanian wilderness hiking takes you through the last great temperate rainforest. Approximately 20% of the entire state is World Heritage listed. Huon pines, some of the oldest trees in the world grow here, some more than 2000 years old. We’ll walk through isolated rainforests, alpine meadows studded with a sparkling mosaic of crystal-clear lakes, wild rivers and rugged mountains. Here, unspoiled beauty abounds in all directions. Our first stop is the Southwest National Park and Mount Anne, right in the heart of the Tasmanian Wilderness World Heritage area. The park, the largest in Tasmania, epitomises the grandeur and spirit of Tasmanian wilderness hiking in its truest sense. At Mt Field National Park, we leave the tourists behind by hiking the breathtakingly beautiful Tarn Shelf, a stunning, lake-studded shelf that was carved out by the force of glaciers from the last Ice Age. A picture-perfect stop at the most photographed waterfall in the whole of Tasmania, Russell Falls is an absolute must. At Derwent Bridge, we’ll explore the middle of the island, including taking a boat trip out to Narcissus and then walking back to Cynthia Bay. We also hike to Mount Rufus for more stunning views over Cradle Mountain Lake St Clair National Park. The grand finale is a couple of days hiking in the Cradle Mountain region. You’ll hike the very beginning of the Overland Track as it winds its way through alpine heathlands brimming with wildflowers, beyond cascading waterfalls and ancient glacial lakes to the foot of mighty Cradle Mountain. If you’re after a shorter Tasmanian Wilderness itinerary then our 5 day Tarkine & Cradle Mountain trip may be for you. Commence in Hobart at 8.30am. Today we cover the first of our Tasmanian Wilderness walks at Marriott and Russell Falls, the latter is one of Tasmania’s best-known scenic attractions. Green, graceful ferns line the track edges while the world’s tallest flowering plants, the magnificent swamp gums, tower overhead. 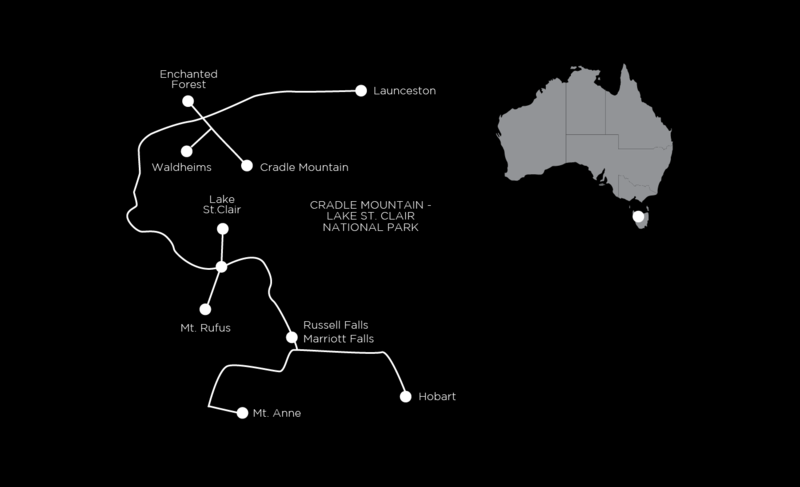 This is a day of scenic driving and Tasmanian wilderness hiking. The Southwest National Park encompasses over six hundred thousand hectares of wild, inspiring country and forms part of the Tasmanian Wilderness World Heritage area. The park, the largest in Tasmania, epitomises the grandeur and spirit of wilderness in its truest sense. We’ll hike up the Mt Anne track to get a birds-eye view over Lake Pedder and the national park. The panoramic views from Mt Anne over Lake Pedder are simply amazing. Today we’ll do nearly a full day hike in Mt Field National Park. The route passes a delightful series of small glacial lakes before reaching the spectacular Tarn Shelf, a stunning, lake-ridden shelf that was carved out by the force of glaciers from the previous Ice Age. Mt Field is unusual in that plant diversity increases with altitude, showcasing huge Pandani groves and other bizarre alpine species. We then take another scenic drive to Lake St Clair. Today we boat to Narcissus and take the beautiful walk back to Cynthia Bay via the Overland Track. Most of the walk is along the lake edge through stunning myrtle forest, loaded with mosses and tree ferns. As we approach Cynthia Bay, the forest transitions into eucalypts. Today we walk the fascinating Shadow Lake Circuit, taking us through forest dominated by Stringybarks. As we approach the lake, the vegetation morphs into a completely different sub alpine forest, including Pencil Pines and Snowgums. Travel to Cradle Mountain at the northern end of the wild Cradle Moutain Lake St Clair National Park via Queenstown. The first view across Dove Lake to Cradle Mountain is an iconic scene of the Tasmanian Wilderness walks. This dramatic vista can be seen on an easy boardwalk. The mountain itself is a jagged, dolerite peak that dominates the area. Its name, is believed to be derived from the mountain’s resemblance to a miner’s cradle. The Enchanted and King Billy Pine walks make up the morning. In the afternoon, we walk to Waldheim Chalet from the interpretation centre, nestled among the myrtles and King Billy Pines at Cradle Valley. Waldheim Chalet takes you back to the time when the Weindorfers first offered their renowned hospitality to their guests. Having fallen in love with what is now Cradle Mountain – Lake St Clair National Park, Gustav and Kate Weindorfer built the rustic home and guest chalet in 1912. The chalet was named Waldheim, meaning ‘forest home’. For some, today will be the highlight of the holiday. The hike starts with an ascent of stunning Hansons Peak. There are some airy sections and steep gradients, so we’ll take it slowly. From here, we’ll continue along the face of Cradle Mountain. We return on the most famous section of the Overland Track as it winds its way through alpine heathlands brimming with wildflowers, past cascading waterfalls and ancient glacial lakes to the foot of mighty Cradle Mountain. The traverse of this elevated alpine area epitomises the special qualities of Tasmanian wilderness hiking. The jagged contours of Cradle Mountain epitomise the feel of a wild landscape, while ancient rainforest, alpine heathlands and button grass plains ensure there is always something to catch your attention. This not the end of this expedition. We finish with a walk at Liffey Falls. This a wondrous place and delightful walk alongside the Liffey River through thick forest and masses of tree ferns arriving at the tiered waterfalls. We lunch at the falls, breath it all in and prepare ourselves for the 1 hr drive back to Launceston arriving at around 4:00pm. The Tasmanian Wilderness walks are quite varied but they’re mostly well graded and easy to negotiate, with a little bit of rough rocky track at Cradle Mountain. Full day walks average about 14km. There’s a real opportunity for fit walkers to really challenge themselves on some of the days. We stay in high quality resorts like Cradle Mountain Hotel and Lake St Clair Lodge. All the rooms come with ensuites. The accommodations are in beautiful locations next to the national parks, providing a further opportunity to walk and explore. Almost all the two course dinners are prepared by professional chefs in the accommodation restaurants. Savour some of the best local produce this country has to on offer on a daily basis with meals emphasising local Tasmanian fare. Importantly, you’ll start each day with a cooked breakfast prepared by the lodge chefs. This is a great way to ready yourself for the upcoming walk. The packed lunches and picnics complete the circle ensuring that your appetite is always satisfied. A walkers lunch may include a high protein type salad, a roll or a wrap, a muesli bar, cake or muffin and a piece of fruit. Each day is slightly different. Lunch is always augmented by Auswalk’s trail mix. You can look forward to having lunch each day at a different incredible location. This holiday starts in Hobart and finishes in Launceston. Both are accessible by plane from the mainland. Mt Anne is a moderate climb with one steep section. Mt Field offers moderate walking with a couple of short sections of steep uphill and short sections across boulders. At Lake St Clair, the walking is moderate. Cradle Mountain offers some choices ranging from moderate to quite challenging. The tracks are mostly well cared for, dry and firm this time of year. However, on the odd occasion we have encountered the uncharacteristically wet portion of track. Most of the walks are moderate. The easier alternative walks are great for first timers. Keep in mind that the walks often involve challenging walking, 5 to 6.5 hours each day, with some steep ascents and descents so the experienced hikers won’t be disappointed. This trip operates with two professional and experienced guides, knowledgeable of the area and natural surroundings, including the local fauna, flora and history. They can offer easier and harder walk options along the way. Pre and post tour accommodation: There are many good hotels in Hobart, however we pick up and drop off at one central accommodation, the St Ives Apartments, 67 St. Georges Terrace, Battery Point, Hobart. The tour starts at St Ives Apartments at 8.30am. We arrive in Launceston at approximately 4.00pm on the last day. Summer is our preferred time of year for hiking in Tasmania. It is suitable to hike Tasmania’s wilderness from November to May. See the Bureau of Meteorology for information about average temperatures and rainfall at different times of the year.